The French designer, architect and engineer Jean Prouvé believed that the aesthetic of a piece needed to adhere to its structural requirements. This belief is perfectly represented by two of his most famous creations: the Standard Chair and Table. The Standard Chair, designed and produced by the French designer and engineer Jean Prouvé in 1934, exemplifies a fundamental aspect of Prouvé’s numerous furniture designs and architectural works: his unwavering focus on structural requirements. In fact, Prouvé regarded himself as an engineer throughout his lifetime, and he was both the designer and manufacturer of his product ideas. His unique oeuvre, ranging from a letter opener to door and window fittings, from lighting and furniture to prefabricated houses and modular building systems, encompasses almost anything that is suited to industrial production and construction. The original wood model of the Standard Chair. Chairs take the most stress on their back legs, where they bear the weight of the user’s upper body. Although it is hardly a surprising discovery, no other seating design demonstrates this principle as clearly as the Standard Chair: while tubular steel suffices for the front legs, which bear a relatively light stress, the back legs are made of voluminous hollow sections that transfer the primary weight to the floor. The profile of the back legs, formed from thin bent sheet steel, resembles an aircraft wing, with the widest measurement at the point where the leg meets the seat frame – that is, where the stress is greatest. The tapered shape of the hollow section from the seat surface upwards simultaneously defines the angle and position of the backrest. 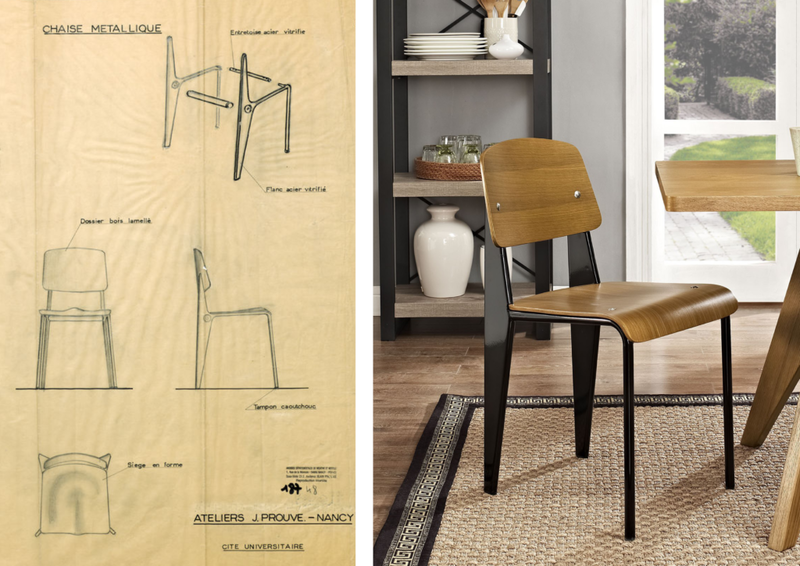 Technical sheet for the Standard Chair and the early version of it. The 1934 model was introduced as Chair No. 4, since it had been preceded by three prototypes; further versions continued to be developed under the name ‘Standard’. 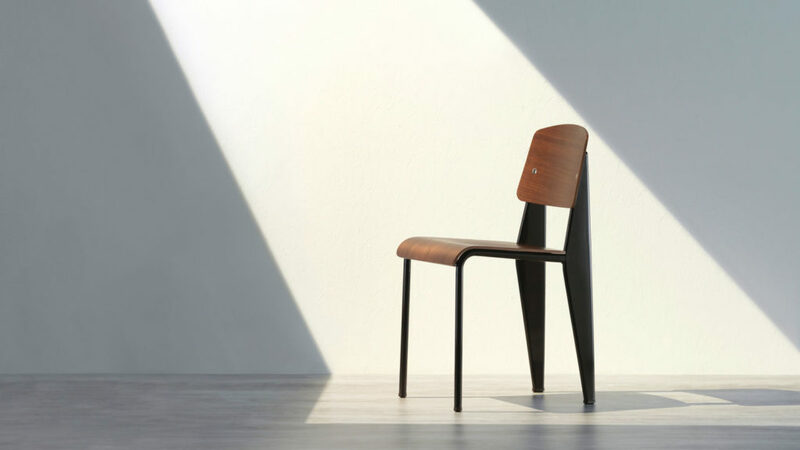 The chair was manufactured in Jean Prouvé’s own factory. Most models had a metal frame and legs, with a seat and backrest made of wood. Other variations were made completely of metal or – especially during wartime and the related metal shortages – entirely of wood. Some had cushions in various materials, or demountable components for ease of transport; the last models with back legs made of aluminium followed in the 1980s. A newer version of the chair has the wood substituted by plastic: the Standard SP (Siège en Plastique) builds a bridge from past to present, giving the iconic chair a contemporary look without altering its form. 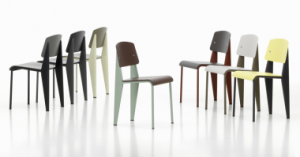 It is made of robust plastic, the seat surface and backrest of Standard SP come in a palette of finely modulated colours and the durable matt finish of the powder-coated bases matches the plastic surfaces of the chair. The new version of the Standart Chair: Standard SP. Materials: seat and backrest in oak or walnut; base in bent sheet steel and tubular steel with a powder-coated finish. Size and measurements of the Standard Chair and the Standard SP. The designer and engineer Jean Prouvé developed the EM Table around 1950 for the project ‘Maison Tropicale’. Adhering to the aesthetics of necessity, even the smallest details of this table are determined by its construction. The canted legs are connected by a crossbar, illustrating the forces and flow of stresses in a way that is typically seen only in engineering structures, thus making the aesthetic appearance a consequence of structural requirements. EM Table by Jean Prouvé for Vitra, 1950. Standard Chair and EM Table, Jean Prouvé for Vitra, 1934-1950. The EM Table is produced in a range of sizes and finishes that make it the perfect choice for any occasion, It is in fact available with several table tops: in premium solid wood, robust HPL laminate (in a choice of colours) and – for tops measuring 2000 or 2400 mm in length – in oak veneer. 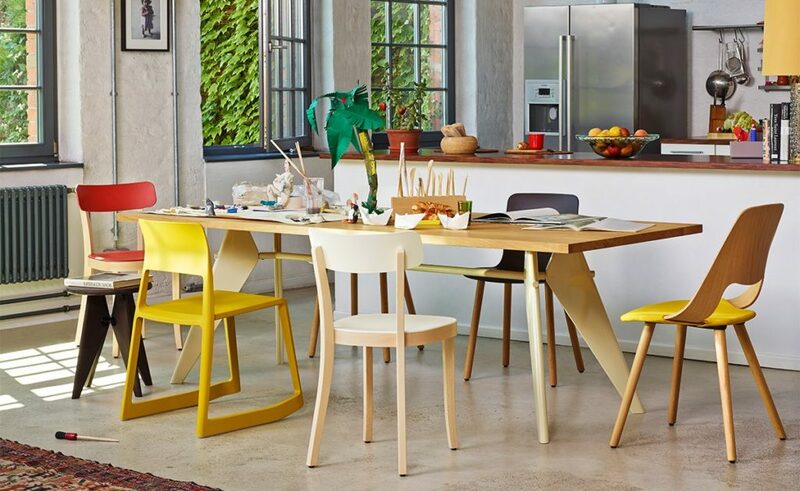 The version with a robust HPL table top has a base with a powder-coated textured finish in the same colours as the frame of the Standard SP chair – making them ideal companion pieces. These furnishings can be used to create different moods with colours and shapes that are unusual in offices and meeting areas. The version with a robust veneer top in light or dark oak is suitable for meeting areas as well, but also canteens, restaurants and other public or semi-public spaces. An example of interior design relized by arranging the EM table with several Standard Chairs. Which are the Materials of the EM Table? Veneer table top: 34 mm thick; natural oak or dark stained oak, protective natural lacquer finish. HPL table top: 34 mm thick, high pressure laminate surface and edges. Base: bent sheet steel and tubular steel, powder-coated (fine texture). EM Table, dimensions and measurements of the three different scales available.